by Linda Taylor, reprinted from the Huffington Post. In my life and in my experience, that is sometimes what we do. When we don’t receive the welcome we want—when things aren’t going as we think they should—our first response may be to do our best to rain down fire on whoever’s offended us. We don’t do that all the time, but sometimes we do. Last week—those of you who were here might remember and those of you who weren’t here will now hear the story—our Prayers of the People were a litany around the event in Orlando. The phrase “gun violence” occurred several times in that litany. For some people that phrase felt like a lack of hospitality. It felt like their perspective was being dishonored or ignored. And a marvelous thing happened. No one rained down fire on me. No one. Two people approached me directly and talked kindly with me, helping me hear their perspective. Two others sent carefully worded, thoughtful and loving emails. These were love letters explaining their perspective. I was deeply grateful for all four of these people, because I know that if four people have a feeling in a group this large, there are others. I am grateful for those who let me know what they were experiencing—and who didn’t attack me. There have been times in my life and in my ministry when I have been attacked. We have all been attacked in our lives, and we know that it doesn’t help the situation very much. But these folks did what they could to help us move toward common ground. And I am grateful. Yesterday, we held our very own Living Room Conversation right here at Saint Andrew’s. Thirty people from Saint Andrew’s and other churches came to be part of this experience. I will tell you that I was a little bit nervous going into this thing. Our experience at the Living Room Conversations conference in Salinas last month had been powerful, but this was here, and this was under my watch. I wanted it to be good, and I didn’t know if it would be or not. We had two conversations. First was a conversation about our conversations in our past. We responded to the guiding questions: How have we talked with people in the past? What has that been like? What did we bring to those conversations? What made it difficult? What made it easy? After that introduction, we had a choice about sitting in conversations about Orlando or about talking politics in church. So we had three tables of people dealing with the politics issue and two tables with Orlando, and the buzz in the room was fabulous. There was talking and there was listening. There was more talking and more listening. At the tables at which I participated, I was impressed by the way people listened. They didn’t interrupt. They said what they needed to say, and then they listened and sometimes asked clarifying questions to help them understand the other person’s perspective. After the first round of conversation, a participant named Ann Marie remarked to the group, “After all, we’re just walking each other home.” (quote from Ram Dass) We’re all going to the same place, and we’re all on a path. Sometimes our paths converge. Sometimes they separate, and we can hardly see each other, much less hear each other. But on the good days, we’re walking on the same path, close together, and we’re walking each other home. I think that will always stay with me. I get goose bumps every time I say it, and it feels like the work of the Spirit happening right now and right here. And I am so grateful for Ann Marie’s words because they brought a special tone to our time together. We all heard what she said. We know that the path isn’t always easy. Jesus said we don’t build the kingdom of heaven by putting our hands to the plow and then turning back. We all put our hands to the plow when we made our baptismal covenant promises. And some days we’re hanging on for dear life to the handles of that plow. Some days we have smooth going, and some days there are rocks. Some days there are trees. Some days we can hardly make it an inch further, but when we’re together, it’s a little bit easier to do. When we’re walking with each other, everything is easier. When we’re looking for the common ground that we share, we can all find hospitality, and that’s good news. 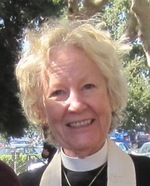 Linda Taylor is an Episcopal priest and spiritual director whose ministry focuses on helping people deepen relationships with themselves, each other and the Holy. This blog is adapted from a sermon she preached June 26, 2016 on Luke 9:51-63 at Saint Andrew’s Episcopal Church in Saratoga, California, where she currently serves.